Multilingual Support. 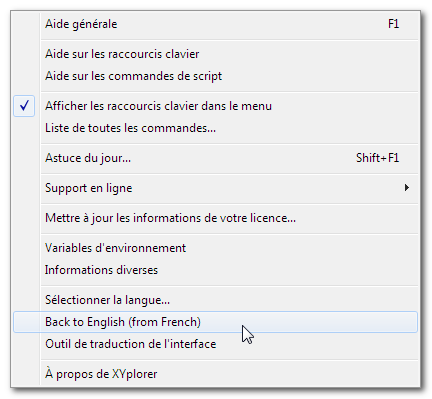 XYplorer now supports interface languages other than English. Currently translations for French, Italian, Polish, and Portuguese are available. Languages can be loaded and changed on the fly without restarting the program. 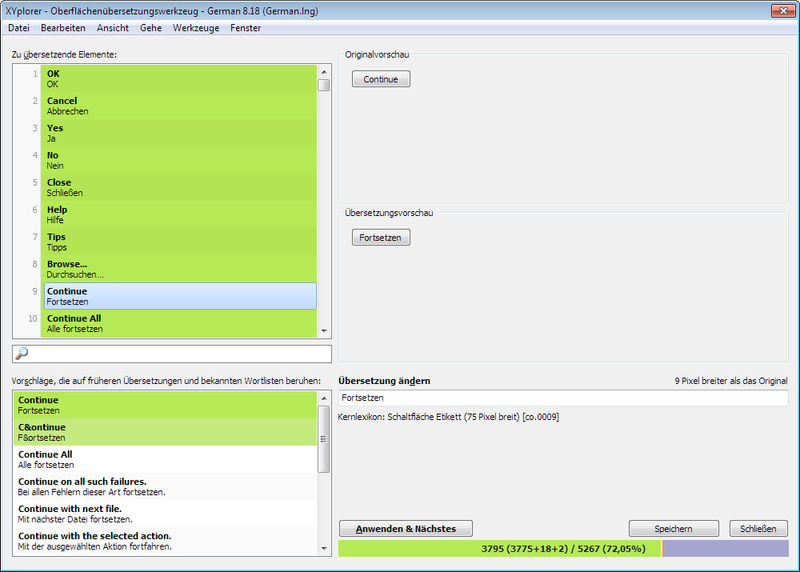 From version 12.10 onwards loading a language has become even more comfortable. 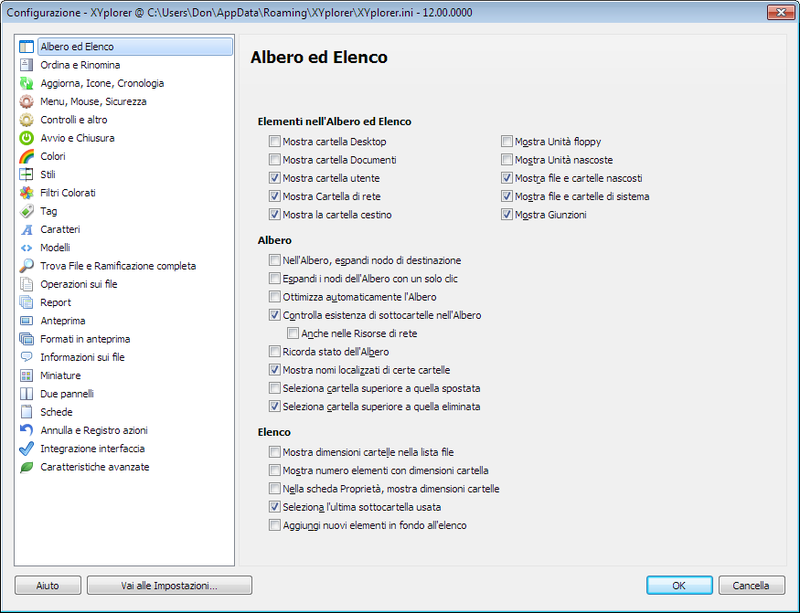 Language files for a growing number of languages are available for download on this web page: https://www.xyplorer.com/languages.php Download the ZIP archive for the language you need (e.g. 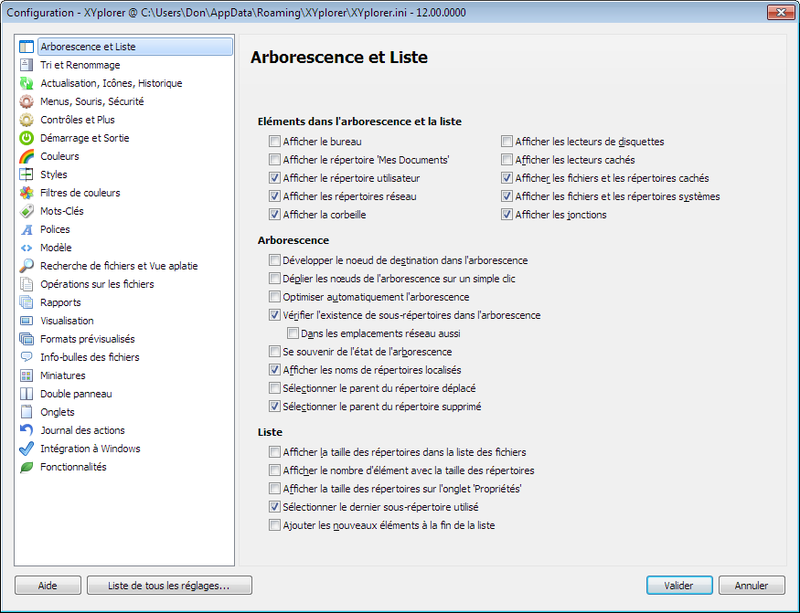 "French.zip") and extract the contained LNG file (e.g. 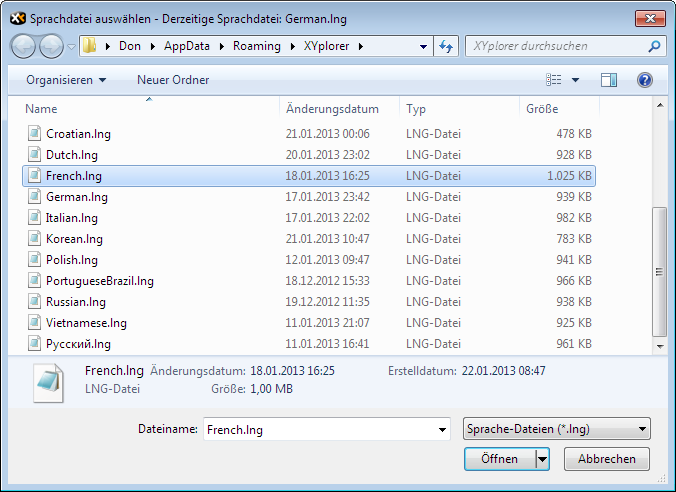 "French.lng") into XYplorer's application folder or application data folder. Choose Select Language... from the Help menu to load the language (e.g. "French.lng") into the running application. No restart required. 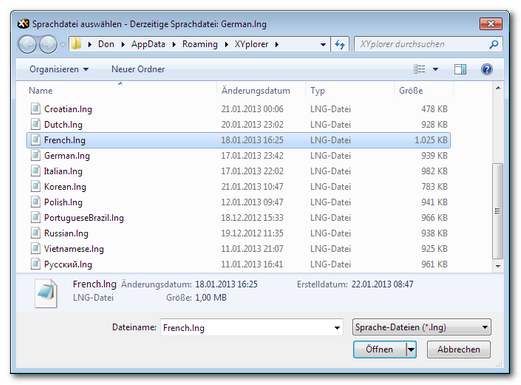 If you have downloaded different LNG files you can switch languages on the fly. Again, no restart required. 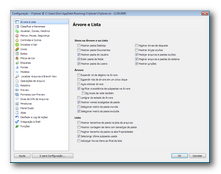 To quickly go back to English simply tick Back to English in the same menu (this command will always stay in English). Untick Back to English to go back to the loaded language. Again, no restart required. 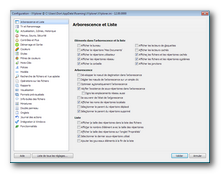 "Back to English" (here from French) in menu Help. In a blink and without a restart you can switch back to factory default English. 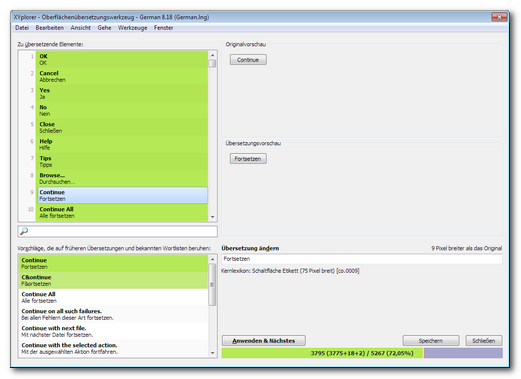 Interface Translation Tool. You can easily edit a translation or create a new one yourself. If you want to contribute to XYplorer and translate it into your language please see this page. 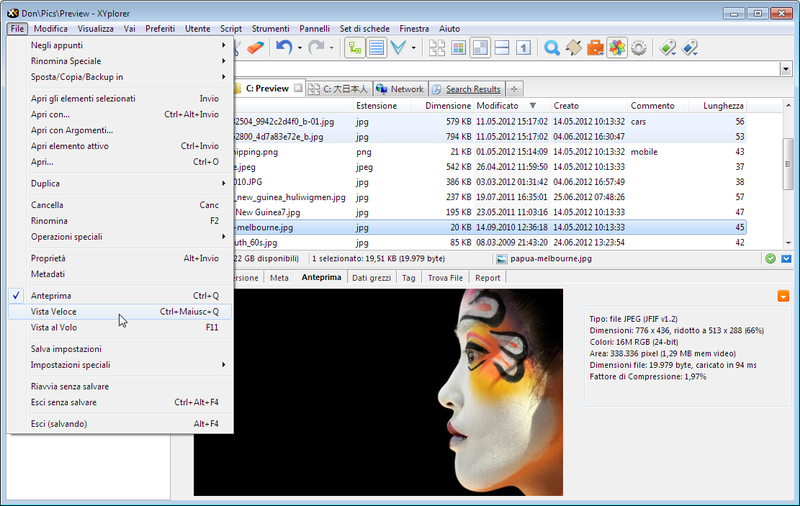 A detailed description of the Interface Translation Tool is found in the XYplorer User Forum. A possible alternative use of the Interface Translation Tool is making personal annotations to any text bit in the whole XYplorer interface. 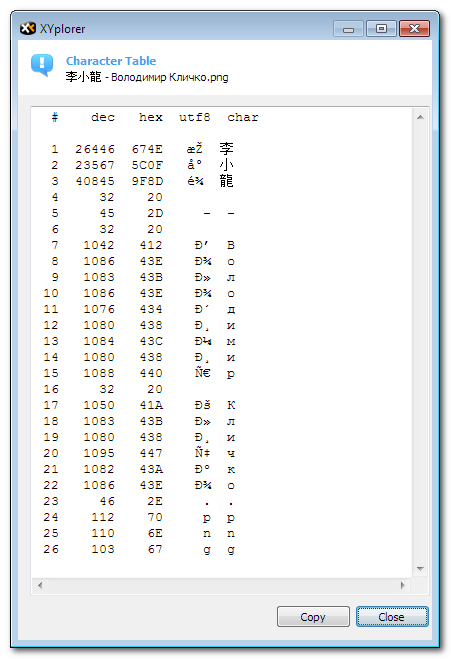 If you want to make annotations to the original English version of the program, you first have to load a language file containing the untranslated English text bits. This file is called Reference_*.lng (* is the Language Support version number) and contained in this archive. Then you can edit the original texts and add helpful remarks. If your remarks are of general use you can share such an annotated language file with other users. Funny Characters. Flabbergasted by strange, weird, funny, unknown characters in a filename? Now you can analyze the characters in a filename and optionally replace the funny ones using the new command "Convert to ASCII". This includes, among other conversions, Cyrillic to Roman transliteration. Select "Show Character Table" from the right-click menu. The Character Table of the selected filename. 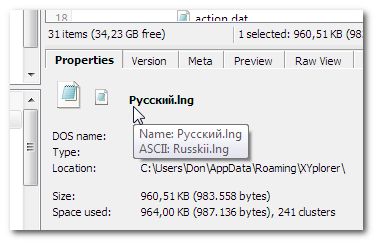 Hovering the bolded filename will pop a tooltip showing the filename converted to ASCII, including transliterations of special characters from German, Scandinavian languages, and Turkish, and romanization of Cyrillic characters. Finally you can read Cyrillic. 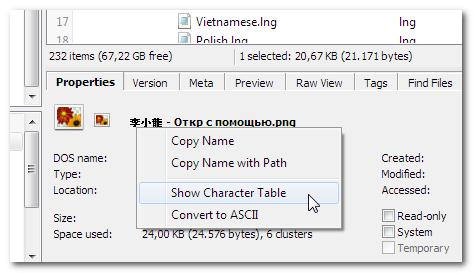 Last not least you can convert the filename to ASCII including all the transliterations mentioned above. The new command Convert to ASCII in menu File | Rename Special does it for all selected files. Licensing. The Standard License (US$ 29.95, EUR 24.95) is now the only license on offer. And there is a new upgrade discount of 20% off for those who already own an older Standard License. Of course, all Lifetime Licenses already sold in the past are NOT affected by this at all. They will continue to work with all upgrades to come and without any additional costs.